For the past 15 months, Jenny Litz woke up each morning and checked for tarantula bites on her skin, cockroaches in her shoes, and poisonous snakes on the ground. 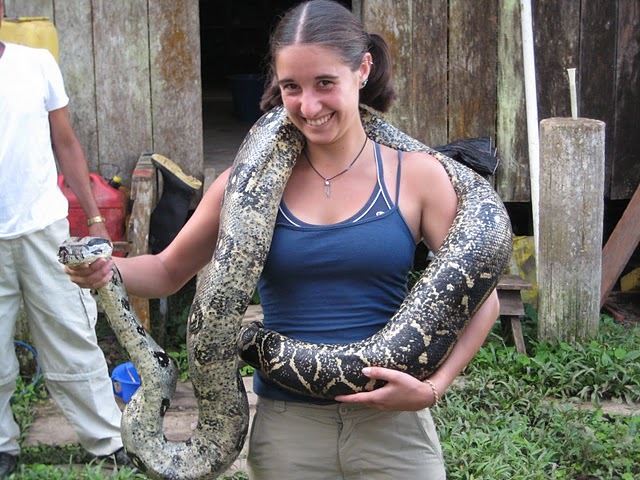 In the coastal rainforest region of Ecuador, where Jenny worked as a field research assistant, such things are commonplace. After interning abroad in Ecuador in college, she knew she belonged in the hot, rainy environment, which was a full 21 hours away from her home in Seattle by plane, bus, open-air truck, and horse. 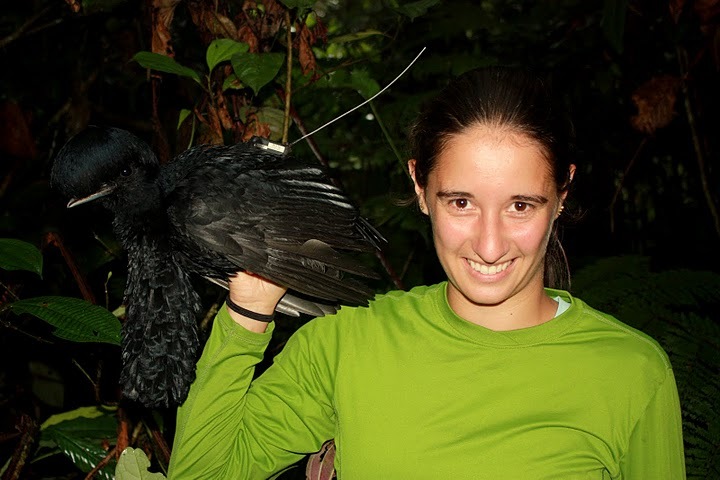 Jenny holding an umbrellabird, with a radio on its back to study its home range. Ties to the rainforest: Since I was a little kid, I always loved the idea of the rainforest. In college, I realized the sad reality: the rainforest was being cut down at a ridiculous rate. Trucks take down huge tree trunks 24 hours a day. It’s very personal for me – I fell in love with this place, and don’t want to it disappear. Why Ecuador? My junior year in college, I interned there for three months in part because I was minoring in Spanish. I worked with scientists from UCLA in a biological research station studying plants, which made me realize I didn’t want to study plants. I wanted to work with birds. So you moved back after graduation? I reconnected with the scientists from the Center for Tropical Research at the UCLA Institute of the Environment and Sustainability. I volunteered in Ecuador on a tourist visa for three months and taught kids in rural rainforest communities about ways to coexist with their environment; their families were cutting down trees to make money, and the children were killing birds with slingshots. Don’t the inhabitants want to preserve the rainforest? You’d think so. But they thought selling the trees was the most profitable use of their land. 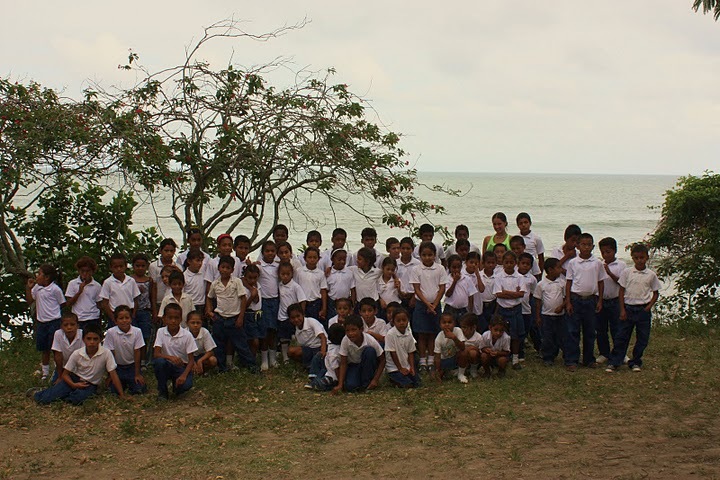 Jenny with a group of children in the rainforest community, where she taught environmental education. What was most striking about their way of life? [The people I worked with] lived in shacks with tin roofs, and their only source of running water was the river. But despite their poverty, these people shared everything. If they had one mattress for their entire family of 12, they gave it to you and slept on floor. What happened after your three-month visa was up? 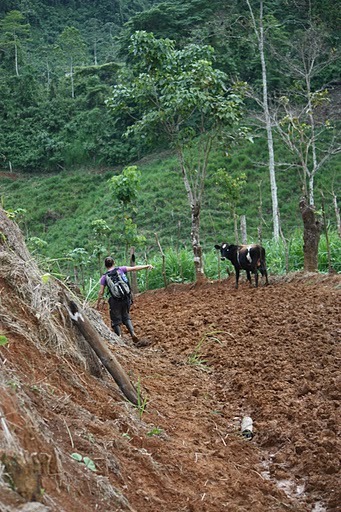 I came back to the United States and acquired a two-year visa to work as a field research assistant in the Chocó region of Ecuador with a group from Tulane University. Did you work with kids again? I studied migratory birds and their population patterns, which is where my true interest was. I spent half my days in the rainforest and half in the capital city of Quito. The dirt road is four hours walking or on horseback. Distance between the Chocó rainforest and Seattle: It’s a 10-hour plane ride to Quito, then a five-hour bus ride to the outskirts of the jungle. Then I got on an open-air truck squeezed with 40 people, chickens, and huge sacks of rice. After two hours on a bumpy dirt road, we arrived at the last place a car could get to, and from there took a horse or walked for four hours, wearing knee-high rubber boots that cost $8 in town. That’s 21 hours total. If you do it all at once. I usually spent the night in Quito. Ecuadorian delicacies: The guinea pig, called cuy, was delicious. I also ate rabbit once, which was dark, juicy, and cooked over a barbecue. Street vendors also sold tons of crazy different fruits, like fresh passion fruit. 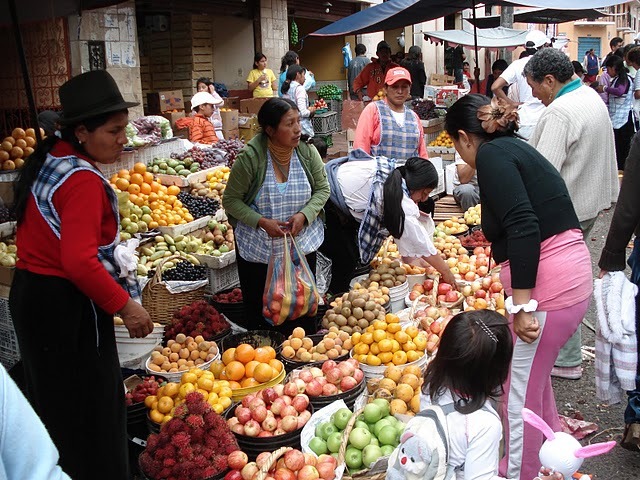 El Mercado, the market in Ecuador, sold lots of fresh, cheap, and delicious fruits. Anything you didn’t try? The skull soup, which was served with sheep’s head in it. You’re supposed to eat its brains. Job responsibilities as field research assistant: Waking up at 4 a.m., hiking to the study site, and opening mist nets for the birds to fly into. 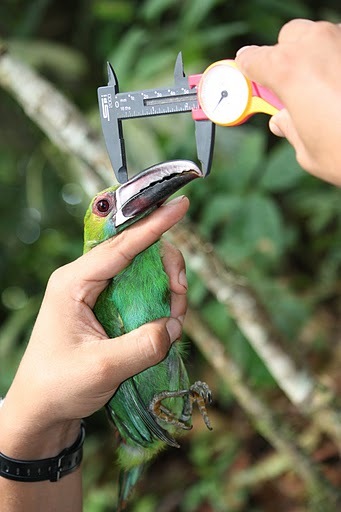 We often caught four to 10 birds every half hour, and would then measure, examine, and release them. Examine them for what? We attached a small metal bracelet to each bird’s foot to identify the species if we caught if again years later. We also took a tiny blood sample and removed two tail feathers from each bird, which served as DNA samples. The samples and data were taken to labs at Tulane for comparative studies on life spans and growth. How many bird species did you encounter? There are 1,640 species of birds in Ecuador. In the area we worked in, there were 350. Our nets were only nine feet tall, so they didn’t catch birds in the canopy, like parrots. Favorite bird: The endangered umbrellabird was emblematic of our project; almost nobody had ever studied it before this project. The feathers hanging from its chin looked like a long beard. Best part of the job: Being so close to the animals. I held toucans in my hands and felt the wind from bats’ wings just inches from my face. Worst part of the job: Waking up at 4 a.m. every day and hiking in rainy, hot, and muddy conditions. The lifestyle in general is pretty hard. Besides for the rain boots, what’s your jungle attire? High nylon soccer socks, convertible zip-off pants, and light, breathable tops. I always carried a backpack with a 1.5-liter water bottle and bugspray to avoid mosquitoes carrying Leishmaniasis parasites, which make holes in your skin. What changed between your first and second trips to Ecuador? I eventually got used to the tarantulas in my room, the cockroaches in my shoes, and the poisonous snakes everywhere. I’d often see small gravesites on roadsides where someone had been bitten and killed on the spot by a snake. Did you have reverse culture shock coming back to America? I was blown away. Everyone has a smartphone, and there are these weird squares you scan [QR codes]. What did you miss about America? My family, obviously. And Cool Ranch Doritos – Ecuador sold other types, but not Cool Ranch. What are your current plans? I’ve been substitute teaching since I returned in May, and now I’m applying to grad school to study conservation ecology. I want to focus on tropical environments and complete my thesis in South America. Greatest setback: I applied for a Fulbright grant in Ecuador and came back as an alternate. Getting funding is so complicated – my research depends on grants. Have you ever felt in danger as a woman in the rainforest? Rainforest communities are very patriarchal societies. People there assumed [my boyfriend] Luis and I were married, and asked why I didn’t already have 10 kids. Women definitely don’t have equal rights, but I never felt in danger. 1. 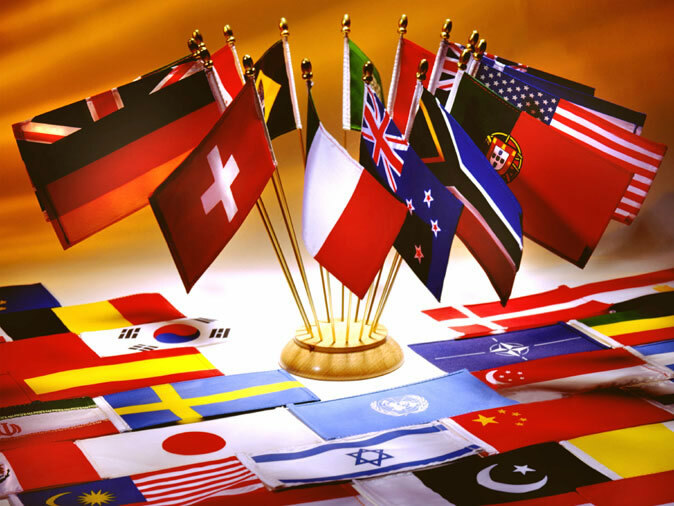 Study a foreign language, then travel or intern abroad in your area of designated fieldwork. It changes your way of looking at the world. 2. Research people who are involved in your field of interest. Contact whoever is heading up a cool new project and ask about volunteer positions; don’t be afraid to make a cold call. 3. Look at and subscribe to online publications like The Wilson Journal of Ornithology. Visit Jenny’s blog at jennylitz.tumblr.com and check out more exclusive rainforest photos on the No Joe Schmo Facebook page! Unless otherwise noted, all photos courtesy of Jenny Litz and Luis Carrasco. Did you study abroad in college and want to return there post-graduation? If so, where? Comment below! This entry was posted in Crazy jobs, Facebook exclusives, Volunteer opportunities and tagged choco rainforest, doritos, ecuador, fulbright, jenny litz, Leishmaniasis, quito, UCLA Institute of the Environment and Sustainability, umbrellabird by Megan Hess. Bookmark the permalink.